When thinking about the design of a new web project, we always want it to exude professionalism and style. Every year we anticipate new smashing design trends to hit the web. While some tendencies come and go, others remain in great demand among the web users from year to year. The one that we are going to focus your attention in this blog post is material style and the way it can spice up your web page. Introduce by Google back in 2014, it is still gaining popularity among the web audience. 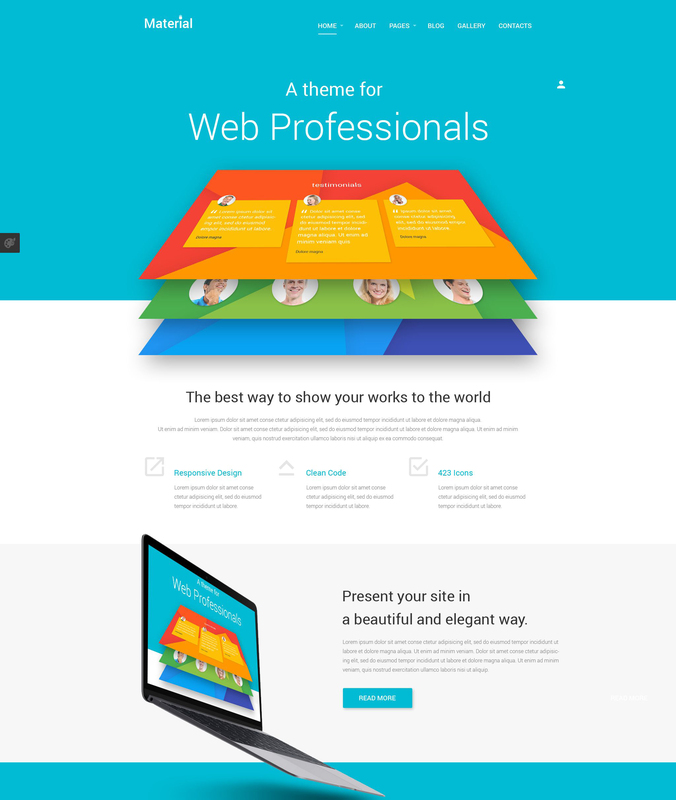 In 2016, more cool and stunning website inspired by material design trend are expected to hit the web. With the purpose to help you bring a refined, trendy look to your new or existing web project, we are happy to present Material Joomla theme from TemplateMonster, which you can purchase at a 30% discount (use promo-code MATERIAL during the checkout). Material Joomla theme from TemplateMonster is best suited for business and personal sites, blogs and online portfolios. 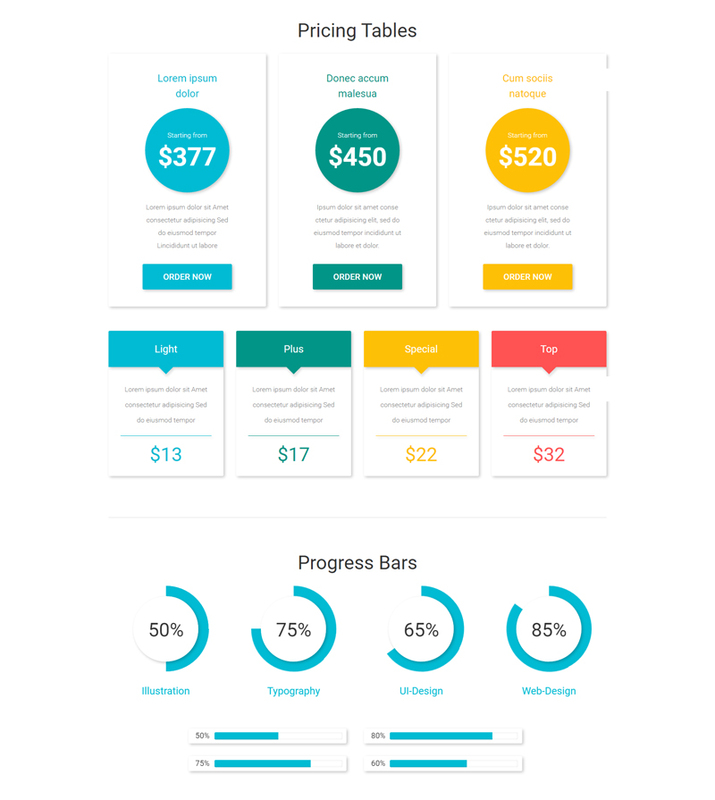 Running on a fully responsive framework, the theme’s layout can adjust flawlessly to any screen size and resolution that the users browse your website on. Cross-browser compatibility and SEO optimization have become indispensable features of all TemplateMonster’s Joomla templates.Well-documented, the theme also includes free 24/7 support that can be always accessed via email, chat or by phone. The template was made very lightweight and super user-friendly. Its outstanding visual appeal is spiced up with a pack of advanced customization features that you can access in the theme’s dashboard. Interested? Let’s now review the theme in details. The theme’s navigation is presented with a sticky MegaMenu, back-to-top functionality and a login form fixed to the right sidebar. The best thing about each of the aforementioned elements is that all of them are fully customizable and can be configured to fit your web project perfectly. MegaMenu supports a drop-down functionality and can display literally any kind of content that you can think of. Row and column based content positioning allow you to share loads of data in an easy to scan way. In addition to links to the rest of your site’s pages, MegaMenu supports images, videos, banners, icons, buttons, etc. In addition to a selection of layered PSD files, the theme includes 14 pre-designed pages for Home, About, Contact, FAQ, Pricing, Our Team, History, Testimonials, Site Map, Forum, Careers, Portfolio, Elements, and Template Settings. Blog and gallery functionality were also pre-loaded into the package for a quick start of your business. 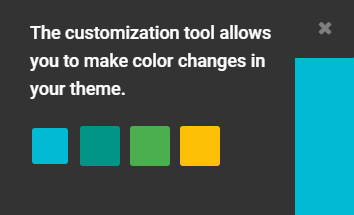 The theme was integrated with a color switcher tool, which allows you to tweak the color scheme of your site with a click. Blue, turquoise, green and yellow options are available. You can switch between those options as many times as you wish, while keeping all of your site’s content safe and secure. The theme was also enhanced with an assortment of multiple UI elements so that you can add any type of content to your site with ease. Thus, when downloading the theme you will be granted with counters, progress bars, lists, block quotes, accordions, pricing tables, and so much more. All UI elements are fully customizable and can be easily tweaked in accordance with your brand identity. With the purpose to make it easier for you to add various types of functionality to your site, Material Joomla theme includes multiple smart modules, with the help of which you can expand and enhance your site’s performance. 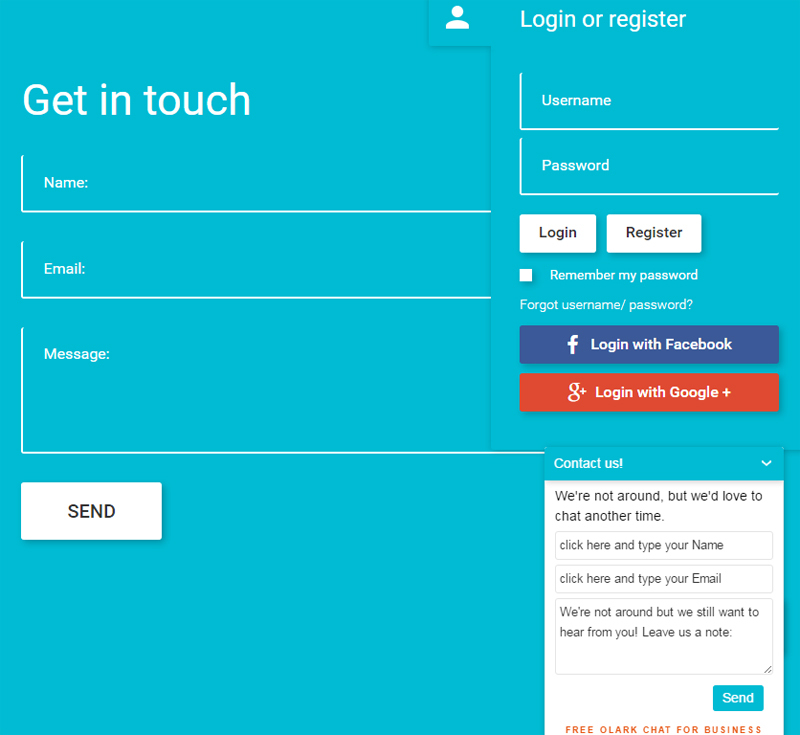 Thus, the pack includes Live Chat with Olark Add Counters, Joomla Social Login, Social Media modules, Social Networks integration, TM Addthis, progress bars, TM Ajax live chat module, TM Ajax Contact Form module, Articles Single, CarouFredSel, Bootstrap Collapse, Bootstrap Tabs, and much more. When a user reaches your site, he/she will be introduced to a newsletter form placed above the footer of the theme, which welcomes them to subscribe to your news in a simple and fast way. With the purpose to boost your site’s credibility, the template was integrated with Google Map API, which allows you to mark the location of your company on an interactive map placed on the Contacts page. Contact details, contact form and contact details were placed right below it. Cookie Directive plugin was added to notify the web audience using cookies on your site. In that way you can show that you care about your customers’ web privacy. The theme looks not only functional but also eye-catching. To the greatest extent the effect is achieved due to the integrated Parallax scrolling functionality as well as lazy load effect, which bring more depth and faster page loading, respectively. HTML plus JS animation makes it possible to tweak the visual appeal of your site just the way you want. A pack of Google web fonts is included to personalize the design. 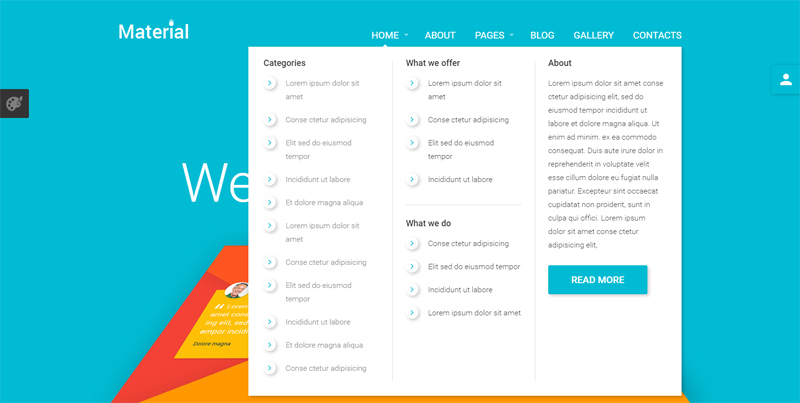 In a word, the template was loaded with everything needed to build a feature-rich and user-friendly website. Material Joomla theme can become a rock-solid foundation of any business of yours. Just give it a try and save 30% on its purchase with promo-code MATERIAL.